One thing you will not see in Disney’s own Carousel of Progress is a huge crowd of people being led around an amusement park by their iPhones. But that is exactly what you will see when you visit any one of Disney’s theme parks. So what is it that is so interesting on all of these iPhones? 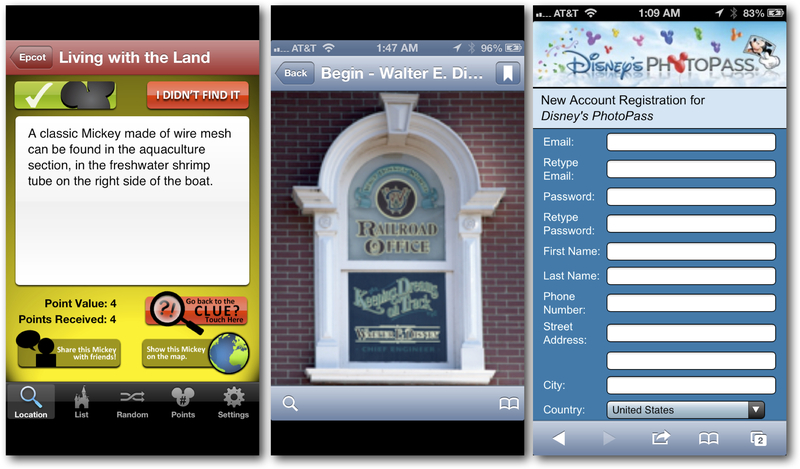 Disney theme park tourist apps. Where to go, what to see and even how long it will take. I can attest that the following are the best apps out there for a Disney trip after field testing on a recent visit to Walt Disney World in Orlando, Fla.
You should first look to see if your local library has any up to date ebooks that you can borrow. I was able to check out a couple of titles before our trip to Disney World began. Additionally there are several titles available on Amazon and iTunes for your Kindle and iBooks app. 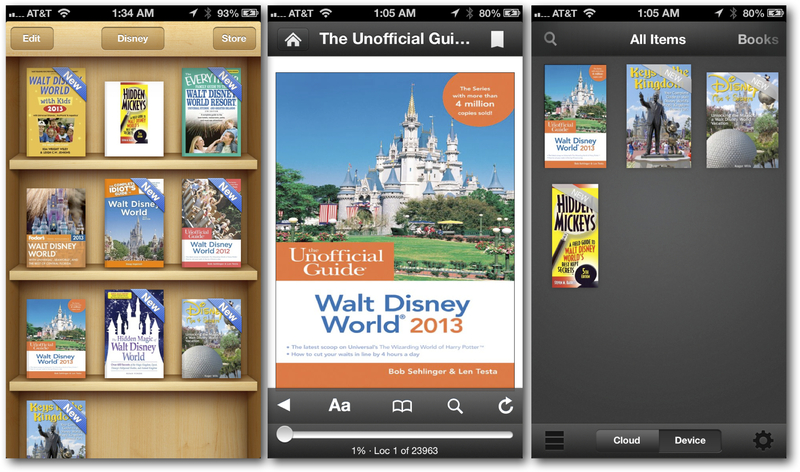 One of my favorites is The Unofficial Guide Walt Disney World ($9.99 Kindle, $9.99 iTunes). Being able to read and bookmark travel guides on my iPhone saved me from packing heavy books in my carry-on. Beyond electronic books you will also find some great informational guides in the App Store. One provider in particular, TimeStream Software, has a couple of iPhone apps published under the title of Notescast that you will find have the same insightful information as the best-selling books. The difference is that the apps are much easier for navigating and finding what you are looking for when you are in a hurry inside the various parks. 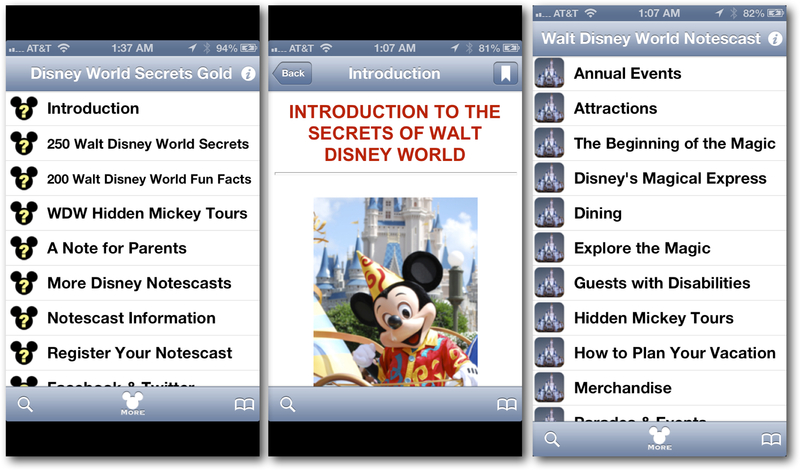 In particular their Walt Disney World Secrets ($1.99 iPhone) is a great supplement to any ebook you may already have in your library. 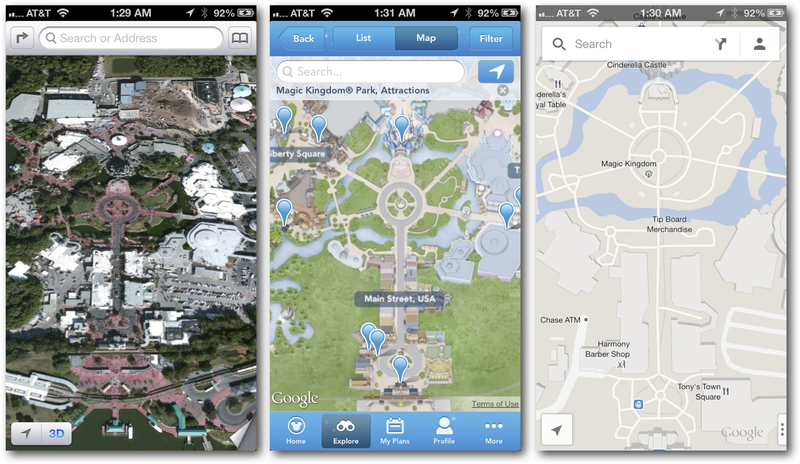 Both Apple and Google have decent satellite and regular maps of the parks in their mapping apps. However, you will find that specialized maps that include the ability to annotate the maps with interactive pins that highlight nearby attractions will help get you to where you want to be. VersaEdge’s Disney World Magic Guide ($4.99 Universal) does exactly this by including the wait times alongside the location. Seeing the wait times on the map may change where you are headed in the first place. 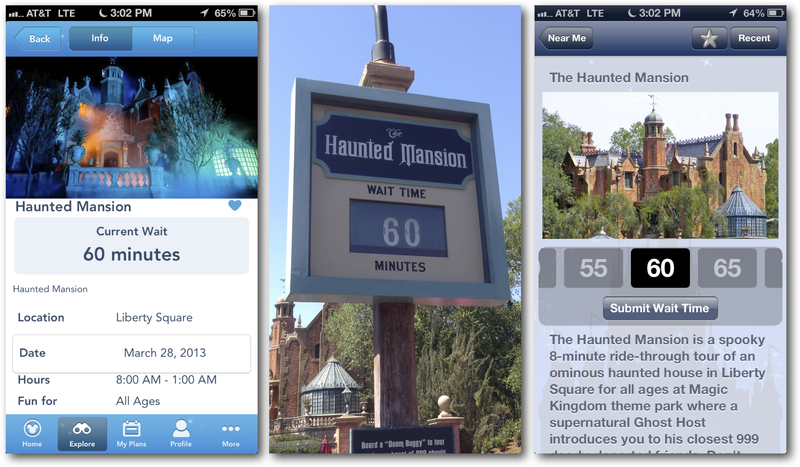 The app also comes with a database with details about the attraction as well schedule for your dinner reservations. This is something that neither Google nor Apple has in their maps. There are two things you will want to keep track of when visiting Disney’s attractions: wait times and FastPass times. While VersaEdge’s Disney World Magic Guide will show you the wait times on a map, what it does not do is show you are the times that the next FastPass is available. FastPass is Disney’s way of controlling large crowds by allowing everyone a chance at getting to ride their favorite rides at least once. But FastPasses do run out. Knowing that the next FastPass for SpaceMountain is for 9 p.m. when it is just 11 a.m. is a good indication that you had better run over to Tomorrow Land and get one before they run out. And the busier the park is, the more likely the FastPasses will run out. Disney’s own My Disney Experience – Walt Disney World (Free, Universal) proved to have the most accurate and up-to-date FastPass information in each park. Disney’s app also has the current wait times, maps and database of attractions. While it did not have FastPass information, I did find that VersaEdge’s Disney World Magic Guide was more responsive while looking up nearby park information. Not every app is about managing your time and keeping track of where you need to be next. One of the fun apps will help you find the Hidden Mickeys ($7.99, Universal) all around the resort. You may have seen the book of the same title in various bookstores for about the same price, but the app is much better than the book. Unlike the book, the app will show you how close you are to each hidden Mickey when you are in the park using the device’s GPS. Another great app to have is actually not a native app. When in the park, you will notice that Disney has a program called PhotoPass where you can be photographed in front of some of the main attractions in the park. There is a mobile web app on Disney’s site that you can create a home screen icon for. This will allow you to view the photos Disney’s photographers take right after they take them. And finally, there is another great Notescast app that focuses on one specific historical Disney feature. While shopping on the Magic Kingdom’s Main Street be sure to check out the Main Street Windows (Free, iPhone). All along Main Street each window has a business title, which is a tribute to various Disney employees and major contributors to various Disney productions over the years. It is sort of like Disney’s own version of Hollywood’s Walk of Fame. While these apps are all specific to visiting Disney World in Orlando, there are versions for its other theme park locations. Be sure you are specific when looking for other books and apps about Disney. You don’t want to get all excited about riding Gadget’s Go Coaster realizing later that it is only at the Anaheim and Tokyo Disneyland locations. Just be sure to devote a little time to loading up your iPhone with apps that will help you enjoy your trip to Disney this year. There’s also an app that I use called TapBanana which presents wait times in a very visual format. It only covers Disneyland in Anaheim right now. But it allows you to find the shortest groups of lines by area. I find that the other apps that give you wait times tend to have you running around the park. There is an app created by easywdw.com. It has all of the wait times for the attractions as well as the times for fastpass distributions. It is very good. How could you leave out MouseWait?